One would hope that escaping indoors would mean getting relief from your allergy symptoms, but unfortunately this may not be the case if your air ducts are dirty. The dust and other substances trapped inside pollutes the air of your home, and this can cause continued or potentially even worsened symptoms concerning allergies, as well as other troubles like asthma. The elderly and children may also experience negative effects on their breathing indoors due to the poor quality of the air. 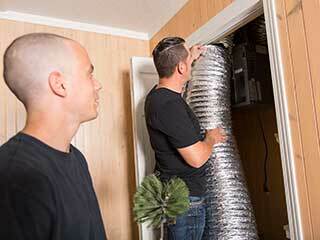 If you notice that any of these troubles persist indoors, it's best to have an expert check out your ducts. A dirty air duct can be the perfect place for any number of pests to make themselves at home, from insects to rodents. In any case, this is certainly problematic for the health of your home's air, particularly with rodents. Their waste carries disease, and this can easily infect your household if they're spreading it through your ducts. If you notice droppings around or inside it, scratches or gnawing marks, dead insects, or odd discolorations, it's definitely time to get it looked at. Mold is dangerous both for your home, and those inside it. It eats away and weakens structures in your home, but more importantly, its spores can get into your lungs and be a huge health hazard. If you notice green or brown spots in or around the vent, or the smell of mildew, your ducts may have an issue with moisture getting inside and creating the perfect environment for mold to grow and spread through your home. You can search more thoroughly by pulling off one of the vents or duct covers and taking a look, both inside and at the vent itself. If there's dust and otherwise sticking out of the slats of the vent, then you know they're clogged up for certain and are wasting your energy as well thanks to air not being able to circulate as easily. If you see debris, dirt, or other materials inside the duct itself as well, it's absolutely time to get it cleaned.